Poland's Government Forcing Supreme Court Justices To Step Down Justices, including the highest-ranking member of the court, have united in defiance of a new law that would force nearly 40 percent of the court's judges into early retirement. Polish Supreme Court Justice Malgorzata Gersdorf (foreground) attends a demonstration in Warsaw on Tuesday protesting the removal of Supreme Court justices because of a new law lowering their mandatory retirement age to 65. Poland is in the grips of a constitutional crisis, with the head of the Supreme Court standing in open defiance of the president — whose party enacted a new law that will force nearly 40 percent of the court's justices into early retirement. The legislation, enacted on Tuesday, reduces the mandatory retirement age from 70 to 65, which reportedly should trigger the immediate removal of 27 out of 73 justices, including the highest-ranking member of the court, Malgorzata Gersdorf. Additionally, the court would be expanded to include 120 justices through government appointments — in effect, giving the ruling party the power to reshape two-thirds of the Supreme Court. This is considered by critics to be the latest in a three-year onslaught of authoritarian reforms to the judiciary system by President Andrzej Duda and his right-wing Law and Justice Party, known as PiS. Duda contends the overhaul is necessary to root out corruption by justices dating back to the communist era and fix an inefficient system. The justices have been given until 12:01 a.m. local time Wednesday to step down. "I will go to my office on Wednesday, but whether I will be let in is another matter," Gersdorf said, according to The Guardian. This latest showdown between the judges, the president and his party is happening on the heels of an announcement Monday by the European Commission — the executive arm of the EU — that it has taken legal action against Poland over the new judicial clampdown laws, which it said "undermine the principle of judicial independence, including the irremovability of judges." 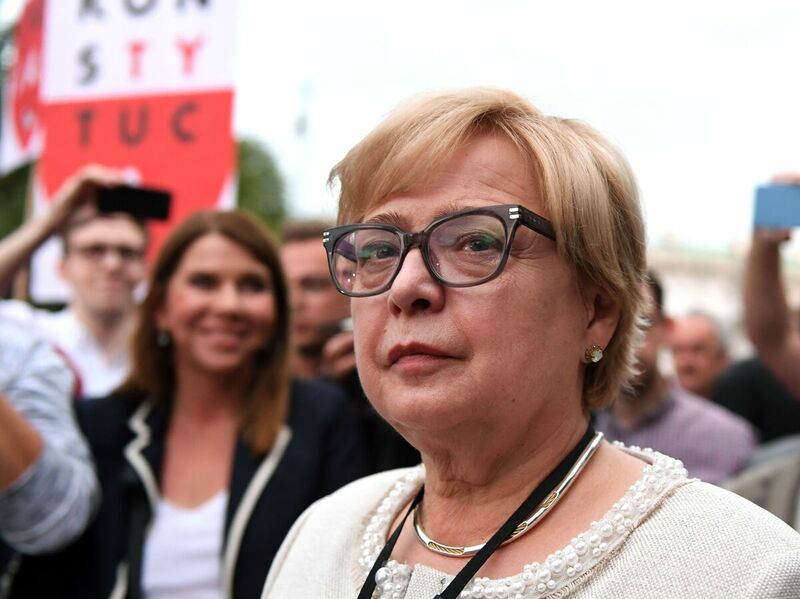 The commission concluded Duda and his party have failed to fulfill their obligations under the EU Charter of Fundamental Rights and have threatened to take the Polish government to the European Court of Justice. An earlier version of this story said Poland had 72 Supreme Court judges prior to the enactment of legislation reducing the mandatory retirement age. There were 73 justices, according to a court spokesperson.